in a world in which success is everything. We all want to be as beautiful, as successful and as smart as we can. And even more so – we want our children to be successful. From an early age, we invest and nurture them – we send them to private tutors and after-school courses, enroll them in private schools – anything that may help them succeed and realize their potential. But doesn’t this kind of success, or realization of cognitive potential, make us miss something important?! Studies have shown that high emotional intelligence (EQ) predicts more success in life than high cognitive intelligence (IQ). Some of you may say, “That’s that then. We can stop investing all this time and money in studies and classes”. While others may still be skeptical about these studies. I do not wish to completely dismiss the importance of the intellectual aspect. I claim that a balanced combination of all our systems will help us achieve maximum success. Identifying emotions – children should recognize a variety of emotions. Six basic emotions to be exact (fear, anger, disgust, surprise, love, sadness and joy). The older the age, the more emotions one should know and be able to name. When we are able to identify our emotions, we are more likely to respond with self-control and emotional comprehension rather than habits that do not always lead to effective behavior. • Place the emotion board at the center and the event cards at its side. • Cover all faces with tokens leaving the names of the emotions exposed. Take a card from the event deck and read the event aloud. • The game ends when there are no more tokens left on the emotion board. • The participant with the most tokens wins the game. Emotional management – our ability to know how to regulate emotions and adjust them to various situations. In other words, when we experience a high intensity emotion that does not correspond to the reality or is inappropriate for the situation, it is best to know how to reduce the intensity of that emotion and to control its behavioral expression. This way we may avoid incidents which do not benefit us in the future. 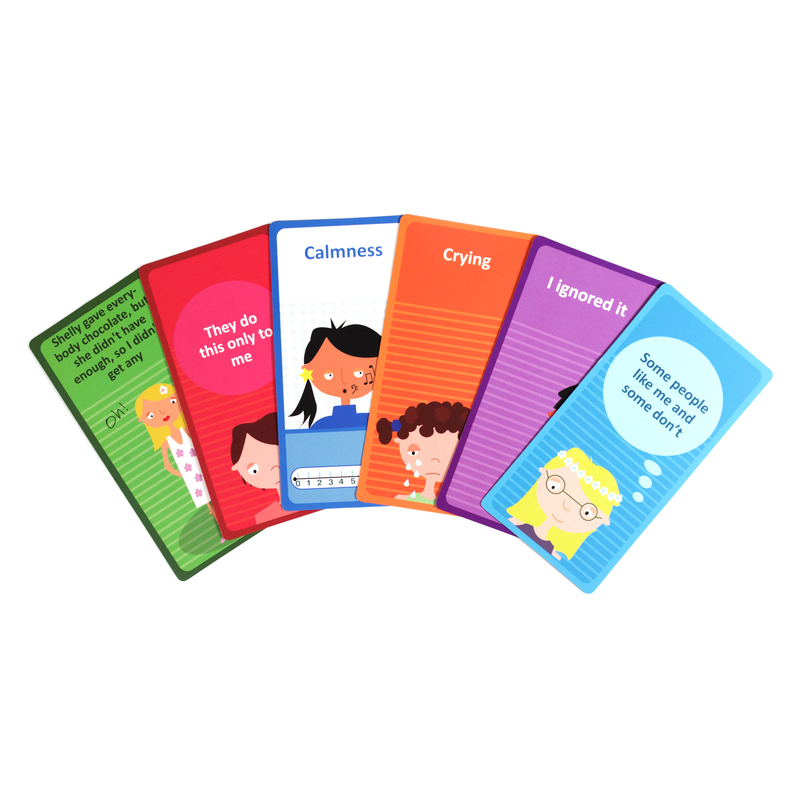 • Give each child 6 emotion cards and arrange them in two rows of three cards facing up. • Place the thought cards near you. receive the thought card and place it over the emotion card (as illustrated). • The first participant to cover their 6 emotion cards with 6 thought cards wins the game. Recognizing others’ emotions (empathy) – recognizing emotions of other people and understanding that they may experience emotions other than ours. You may have noticed that some very young children acknowledge when a peer is sad and try to comfort them, while others may continue playing right next to a crying child, seemingly unbothered. Chances are that children who are empathic to their peers will eventually develop better social relationships than other children. • Place the emotion board at the center and the deck of emotion cards at its side. • Give each participant 3 tokens. events, and that different people may experience different emotions following the same event. the event collects all the tokens, and the turn goes to the next participant. • The game ends when one of the participants is out of tokens. Behavioral control following a combination of emotional, intellectual and social comprehension. That is, a good ability to choose how to behave, and not respond from with the “automatic pilot”. This assists in coping with unpleasant situations not out of a defense mechanisms (fight; flight; freeze). As children become familiar with their own emotional world, they are better able to express their feelings in words rather than in non-adaptive behavior. A child who is familiar with their emotions can also regulate and manage them in such manner as to fully realize their potential with friends, at school and later in their career. It is a well-established fact that most school programs are aimed at academic success. We see billboards and publications advertising schools’ academic success. On the other hand, we see far fewer advertisement for programs for the development of emotional abilities, which are an equally important – if not more important – element on the road to success in life. But schools are not the only ones to blame – let’s admit it we too are culprits in “emotional neglect.” Our busy schedule causes most of us to devote very little time for this issue. We usually try to reach solutions rather than tend to feelings. When your child tells you that they were picked at at school, do you ask them how they felt? Most of us will immediately “shower” them with solutions like, go tell the teacher, hit them back and so on. It is important to help children identify their emotions so that they may understand what provoked their anger and behavior and thus they may better cope with similar situations in the future. Dr. Nava Levitt speaks of fine tuning our systems and having a flexible brain. She claims that emotional intelligence may be developed, both in children and adults. Levitt explains that the brain is like an orchestra; when one musician is off-key, the entire music is off-key. The brain works the same; when one parts isn’t sufficiently developed – social, motor, sensory, emotional – that child will not be able to realize their potential. Therefore it is important to let children experience the world not only through computer screens, but to have them engage in all kinds of activities and social interactions in which the sensory system is fully activated. Social games stimulate the motor element while the social interaction develops emotional capabilities. Familiarize with emotions – talk with your child and try to see check what emotions they know. Write them down, and ask them to tell you when do they feel these emotion and add a short story about each emotion. Share about your emotions; when do you feel calm, loved and maybe angry. Self-awareness – When turning attention to what happens inside – to one’s physiological changes, the thoughts and feelings – one may develop the ability to know themselves and their emotions. What’s more, they may develop the ability to identify with and understand others; a capability that’s becoming less and less obvious in our current digital world. The simplest technique to direct attention to yourself is to focus on breathing. Ask your child to sit for 3 minutes (extending to longer periods over time) and pay attention to their breathing, thoughts, feelings and physical sensations without judgment. Just pay attention. Of course, it is very important that when they tell you about these thoughts, feelings and emotions, you too will react without judgment. Teach your child to recognize the different elements of their emotions. Emotions consist of three elements: physiological reactions (body sensations), behavioral reactions and thoughts. When a child knows what they feel, when they experience a shudder, they will be able to name the emotion, contain it and control its eventual behavior. When a child recognizes a thought, they may know what emotion they experience following that thought, and understand what made them feel that way. Help your child to name their emotions – when you see them fight with their siblings, try to understand together with them what they felt that made them behave this way, and then look for solutions. Teach your child that emotion is a transient state – emotions and thoughts go away by themselves. If we accept emotions as a wave that comes and goes, we can cope with them without having to find an immediate behavioral outlet. Speak about emotions – we all “transgress” with over-emphasizing solutions, texting and using emoticons, while inadequately expressing our emotions in words. Try to speak about emotions at home. Thus your children will be able to continue with this outside. Over time, they will gain better control of their behavior, and develop better communication with others around them. Convey a message that any emotion is adaptive – the role of emotions is to explain what’s happening in our inner and external world. We all want our children to be happy and never experience sadness or anger, but it is important to understand that emotions are not “positive” or “negative.” There are “pleasant” emotions and there are “unpleasant” emotions, but they are all positive because they all play an important role. Let’s consider fear. Many of my patients come to me because they do not want to be afraid. But fear is a mechanism of protection against danger, and sometimes it is important to be afraid, so that we may be careful when necessary. Of course, one must know when to be afraid – only in the face of real danger. In other cases, fear does not serve us and may also interfere with our lives. The goal of therapy is not to eliminate fear (or anger, or sadness or jealousy), but to identify unpleasant emotions, to manage them and to control our behavior even when they “come to visit”. Moderate use of technology – going back to Dr. Nava Levitt, it is necessary to help our children balance and adjust their systems. We must ensure that our children find themselves in real social settings (not only social media), playing and moving their body. Unfortunately, the massive use of technology so abundantly available for children and youth has an adverse effect on achieving this balance. Do not let your child sit for hours on end in front of the TV or computer – limit the use of these devices. Do not let your children “meet” with friends only on social media. Have them get together face to face to talk and play. Set an example – turn your mobile phones off occasionally, talk to them instead of texting them, eat a family dinner without the TV on. Ability to cope with frustration, anger and disappointment – the path to success goes through the ability to cope with and learn from failures (Thomas Edison). If we do not teach our children to cope with feelings of frustration and anger, they will not be able to withstand them later in life. In many cases they will attempt to avoid these emotions and therefore will never challenge themselves. A challenge is a situation in which we risk failure and frustration. If we want to manage our emotions and our lives we must learn to manage them and not let them manage us. So when our children ask us for something, we can wait a bit, we do not have to respond to any request, and not immediately. When our children come home angry about something, we may be empathic and at the same time help them cope with anger and stay with it.